UVA men's basketball players were welcomed by thousands of fans after winning the national championship. 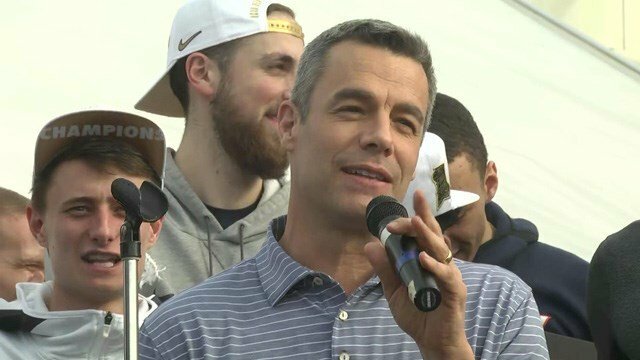 CHARLOTTESVILLE, Va. (WVIR) - The University of Virginia men’s basketball team has returned to Charlottesville as national champions. The team arrived at a welcome party at John Paul Jones Arena to thousands of fans waiting to congratulate them. On Monday night, the ‘Hoos secured the program’s first ever national championship with an 85-77 overtime win over Texas Tech. After one last – likely sleepless – night in Minneapolis, the team returned to Charlottesville shortly after 4 p.m. on Tuesday and arrived at JPJ around 5:20 p.m.
Players and coaches from the team addressed the fans after the warm reception. 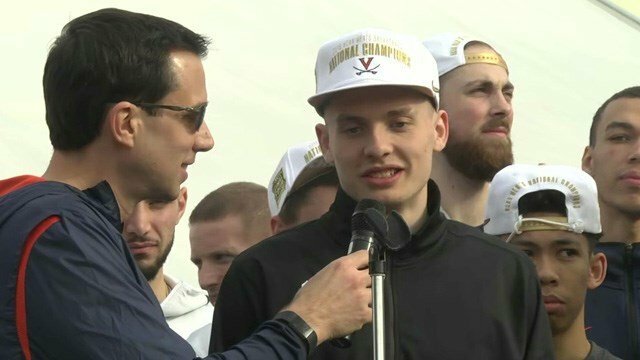 Kyle Guy, the Final Four’s ‘Most Outstanding Player” spoke first, crediting his teammates and coaching staff for the team’s success. Kyle Guy was named the Final Four&apos;s "Most Outstanding Player." Four-time ACC Coach of the Year Tony Bennett spoke next and gave a special shout out to the team’s only fifth-year senior. Tony Bennett won his first national title since coming to UVA in 2009. The national title is Bennett’s first since taking control of the program in 2009. This is the first year UVA has advanced further than the Sweet Sixteen in Bennett’s tenure and its first Final Four appearance since 1984. For many, the last few games for UVA were a mix of emotions. The ‘Hoos trailed were trailing by multiple points with under 20 seconds left in each of the last three games, but still came out on top. “Cardiac arrest…It was just unbelievable. I’ve cried, I’ve screamed, I just love the ‘Hoos,” said UVA fan Donna Hamlett. The team’s title comes one year after being on the receiving end of a historic upset that sent the Cavaliers home in the first round to 16-seed UMBC. For the fans, that redemption made this year’s title all the sweeter. 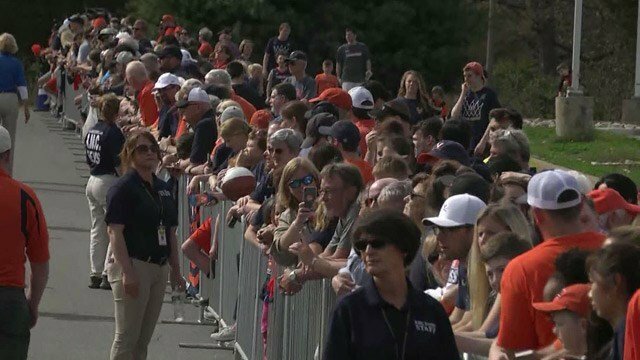 The thousands of fans started lining up outside JPJ around 4 p.m. to welcome the team home. Virginia Athletics will host a celebration on Saturday afternoon. Fans are welcome to Scott Stadium, where the gates will open at 12:30 p.m. for the 2 p.m. celebration.